To be honest about it, wind power or the power of the wind is nothing new to us. Before the advent of ocean liners that were earlier run by coal-fired boilers like the Titanic or were diesel driven like the Queen Mary, sailing ships toiled through the seven seas with the power of wind. In fact, people were so enamored by the power of certain types of wind that they identified them with pretty catchy names like the Trade Wind which propelled ships on certain intercontinental routes. And then there were perilous wind formations, aptly named the Roaring Forties as they were usually encountered within latitude 40 or near about. Why, even those mammoth windmills were overtly used for grinding corn or pumping water for agricultural purposes. What however, is novel concerns harvesting the same wind to generate electrical power. This precisely is equated to electric wind power. Contemporary wind generators also called wind turbines, act on the power of wind. Their specially designed blades or rotors catch the wind while it hits them and they start spinning at a high speed. Not unlike the hydroelectric phenomenon, this spinning movement is transformed into electrical energy produced by a generator mechanically coupled to the rotor. However, the quantum of power transferred to a wind turbine remains directly proportional to the area swept by the rotor, the cube of the wind speed and the relative density of the prevailing wind. Wind turbines that are involved in wind power generation are usually of two distinctive types – (a) turbines that rotate around a horizontal axis and (b) that do so in a vertical axis, although the earlier types are more commonly used now. The HAWT or Horizontal axis Wind Power Turbines are mounted on top of the tower along with its main rotor and the electrical generator. They are pointed into the wind and may have a wind sensor ranged with a servo motor for aligning with the change of direction. They are also equipped with a gearbox for changing the slow rotation of the rotor or the blades into a faster rotation suitable for the electrical generator. More modern wind turbines come with self-adjusting gears, thus eliminating heavy gearboxes. The HAWT turbines are usually pointed upwind to catch the turbulence which is produced behind the tower while the turbine blades are purposely placed further away from the tower as also somewhat tilted to avoid accidental contact with the tower. Conversely, downwind turbines are also in use for generating electricity but these do not need any additional mechanism to keep them in line with the wind. Despite many theories propagated about wind power in the US, not much progress has been recorded there till 2006 when wind power as an energy platform grew by over 25%. In fact, wind power had provided the energy needs of around three million homes in the US and according to the mandate issued by the office of the new US President Barack Obama, more than 50% of fossil fueled generators will be replaced in the country by 2012. Nevertheless, wind power scenario in the United States has been fast changing during the current decade. As a matter of fact, Texas led the way with new wind power platforms, passing California as the state producing maximum wind power. Of course, this had primarily resulted from the 735 MW wind farm of the Horse Hollow Wind Energy Center that was established. However, Texas was not the only state turning cards in the field of wind energy generation since Pennsylvania, Minnesota and Iowa did not lag behind in the wind power race. California that had created history among the US states in developing wind power in a great way has, incidentally given birth to a company known as Clipper Windpower that had received an ‘Outstanding Research and Development Partnership Award’ from the U.S. Department of Energy (DOE) for designing and developing the new 2.5 MW Liberty Wind Turbine, so far the largest wind turbine manufactured in the United States. It was actually developed under the partnership with DOE and the National Renewable Energy Laboratory, USA. Production of personal electrical wind power is also on a high. And why not – after all, there are both ecological as well as financial benefits. While on the one hand, you can clean up the air, on the other you can save on power bills. 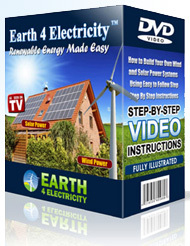 Electrical wind power can work wonders for you provided you know a few simple things such as where to set up your own personal wind power system in the home, how to complete the installation and the wiring, where to get the parts from cheaply and also everything about the safety precautions.